Watching low limit Holdem games online is like seeing a comedy of errors. You see players playing far too many hands, chasing draws that they shouldn’t, and bluffing at pots that they have no chance of winning. Fortunately, due to this weak play by low limit Holdem players (your opponents), it is relatively easy to crush micro poker games online. Any No Limit game with blinds below $0.25-$0.50 is a low limit game that you can beat by simply understanding and implementing two things, the power of position, and correct starting hand selection. Although there are a lot more things that you have to be good at to be a great poker player, simply playing the right hands in the right positions can be enough to make you a winning player at low limit games. Many low limit poker players find themselves in situations where they win a lot of small pots, make some money, and then lose their entire stack in a hand where they hit top pair, but were “dominated”. A player is said to be dominated by another player when they hold the same high card in their hand as the other player but their second card, also known as the “kicker” is of a lower value. For example a player who holds Ace – Ten is dominated by a player who holds Ace – Queen. By avoiding hands that are easily dominated, you can avoid situations where you are forced to read your opponent and make a difficult decision. It’s all about limiting the number of opportunities you have to make a bad decision. Bad decisions cost you money and if you can learn to avoid potential difficult situations before they happen then you can limit your downside potential anytime you sit down at a table. Additionally, by limiting the number of complicated post-flop decisions you have to make and make decisions a lot more straight forward, then this opens up the opportunity to multi-table many more tables much more effectively. One of the big problems with playing tight poker is that, while profitable, it can be a little boring as you are not involved in so many hands, but by multi tabling and playing multiple tables of tight poker helps ensure that you have a good hand to play more often. If you look at the facts behind poker (the maths and probabilities), then it will show you that 80% of the time the hands you are dealt will be rags (poor quality hands that you shouldn’t be playing). So if you are correctly limiting yourself to only playing good hands, then you should only voluntarily be putting money in the pot 20-25% of the time. Although for a full ring (cash) game you will be in the blinds 20% of the time, you don’t count those hands towards your voluntary percentage unless you complete the small blind, or call a raise from the big blind. Limit yourself to the top 25% of hands and you will see that most of the hands you are playing are not easily dominated. In fact, at low limits, with that starting hand selection you will be a favorite to win against any single opponent a majority of the time. The value of poker starting hands is an in depth subject in itself but here is a quick rough and ready guide to the top 25% of poker starting hands. 7-8, 8-9, 9-10 suited (of the same suit). You should always be aware of your position at the table in relation to the blinds. Why? Because your position at the table determines in what order the players act. It is a massive advantage in poker to be able to act after your opponent(s), so the best position to be in is always on the dealer button because you are the last to act. Although on average you should be voluntarily playing 20-25% of the pots you are dealt, you should be playing a lot fewer pots from early positions (closer to the blinds), and many more pots from later positions (closer to the dealer button). A common thread that you will see in poker forums is new players who have downloaded a tool such as Poker Tracker and analysed their game for the first time post something like, “Help! I’m making a lot of money from the button and the cut off position, but losing money from early position!” The answer to that is easy, play less hands from early position. On average, the only two spots you should lose money in are the blinds. Everybody, even the world’s best players, lose money in the blinds essentially because you are forced to play weaker hands out of position. But you should not lose money in any other position! Let’s say that you are a player that on average loses money from the “under the gun” position (the first seat after the big blind). It is obvious that if you played zero hands from under the gun that you wouldn’t lose any money from that position. Equally obvious is that if you only played AA from under to gun, and always pushed all in pre-flop, you could not lose money from early position, because you would always be getting your money in as a substantial favourite You can walk down the starting hand strength chart and identify hands that you do make money with from under the gun. Those might turn out to be as few hands as only the top few strongest hands AA, KK, QQ, and AK suited. If that is the case then the solution is simple, limit yourself to only playing those winning hands from early position. Late position is the spot where you should make most of your money. In late position you are likely to be acting last throughout the hand. This opens up a world of opportunity because your opponents have to give you information by acting before you have to make any decision. They can show weakness to allow you to pounce and steal the pot, or they can give you an indication that you are not going to win the hand, so you can get out of there quickly and cheaply and wait for a better opportunity. Since it is such a powerful position, many more hands become playable. Compared to early position, where only the top 4 to 8 (3%) hands are profitable to play, on the button you can probably extend your starting hand range to 30% or more of starting hands. 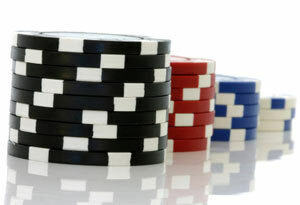 Any pocket pair, any suited connector, any suited ace, any two big cards can all be played (for the cost of the big blind) from late position. Notice one thing that many of these hands have in common, they all have the ability to hit big hands on the flop. Any pair can hit a set on the flop and become a monster hand, a suited ace can hit the flush or the nut flush draw, suited connectors can have powerful straight or flush draws, and big cards can hit high pairs. The beauty of playing these hands in position is that when you have a big hand you can extract the maximum amount of money from your opponents. Let’s say you flop a set (three of a kind). If you flop a set from under the gun, you have to act first and either raise or check giving information to your opponent. If you raise you risk no one calling you because you are showing strength from an early seat. If you check you risk giving your opponents a free card and not adding any value to the pot (which you are probably going to win). From early position, the optimal case would be to check, have an opponent bet, and then check raise that bet so that you have some value in the pot before you reveal your strength. Unfortunately the other players don’t cooperate with that strategy very often. From late position however, all the uncertainty is gone. If you flop a set and an opponent bets, you can decide whether to re-raise and get more money into the pot right away, or just to call him to mask your strength and string him along with the aim of get more money in the pot after the next card. Both are good options. If no one bets the pot ahead of you then you know you should bet, eliminating the opportunity for you to make a poor decision. Even marginal hands are better from late position. If you call with QJs, and hit a Jack on the flop you have a marginal hand if you are playing against several opponents. Your pair could be good, but you could also easily be dominated. If you are under the gun, do you risk betting out and getting raised off the hand, or checking and giving the other players a free card? On the button your decision is easier, if your opponents have shown a lot of strength, then your weak pair is probably no good and you can let it go without too much damage. If everyone has been weak, then you likely have the best hand and can bet it. If you don’t want to take the time to memorize hand ranges and decide how you should play in every position with a given hand, you can use one rule of thumb, If you are the first in a pot, never limp in. To “limp into a pot” means that you just call the big blind and pay the minimum to play the hand. As the first in the pot, you should always be either raising or folding. Limping is fine if you have a drawing hand, like a small pocket pair, and are in position with several limpers ahead of you who have already added value to the pot to match the longer odds that you hit your drawing hand. It is not fine from early position. Limp with that same small pocket pair from under the gun and a lot of the time you will be raised by a player in a later position and either be forced to fold your hand or forced to commit more chips to the pot with a hand that will only hit the flop 10% or less of the time. If, when opening a pot, you always either raise or fold, you avoid putting yourself in bad situations. From late position the raise or fold applies as well. If everyone folds to you in late position you have a perfect opportunity to steal the blinds. You should raise and take advantage of it, or fold because your hand is so bad you don’t want to risk playing it. If you simply open the pot with a limp from late position you are telling everyone that you don’t have a hand that is worth a steal attempt. Your opponents will not credit you with a good hand and you will have trouble winning the pot. Starting hand selection and position play are two of the most important things you need to master in order to win low limit poker games. Most often at low limit Holdem games you don’t need advanced and complex strategies and in a lot of cases advanced strategies only work against good players who are a bit more predictable so all that is required to be a profitable and winning low limit player is to do the basics well. After you understand those basics and use that knowledge to develop a winning poker game, there is no stopping you and you can continue adding more knowledge and become an even better poker player. You never stop learning in Poker.